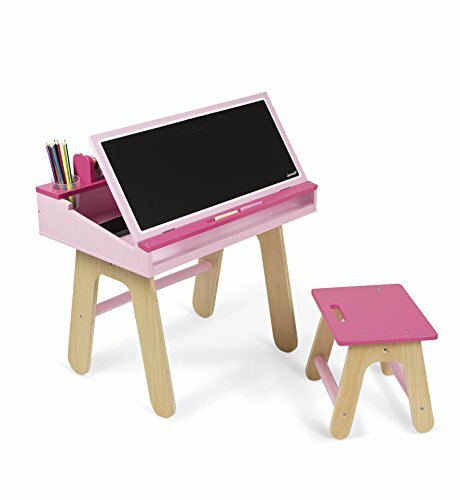 Janod Desk and Chair -Pink is an ideal home-school desk for the creative child. Brightly colored and sturdy, kids will love having their own personal workspace where they can create mini masterpieces for the refrigerator or your office. The desk measures 16in. (41cm.) long x 23.5in. (60cm.) wide x 20.5in. (52cm.) tall, and features 2 cup holders for supplies, a front opening to store artwork and the tabletop chalkboard tilts up to be used as an easel. There’s also a 12in. (30cm.) wide, replaceable paper roll, so your child always has something to draw on. The chair measures 9.25in. (23cm.) long x 11.5in. (29cm.) wide x 10in. (26cm.) tall, has a built-in handle and fits fully under the desk at clean-up time. The desk and chair require adult assembly and all hardware is included. Comes with desk, chair, roll of paper, 2 plastic cups, box of chalk and eraser. Recommended for children 3 to 5 years of age. If you have any questions about this product by Janod, contact us by completing and submitting the form below. If you are looking for a specif part number, please include it with your message.